Are you interested in Arizona and Western history? Love museums and archives? Looking for ways to make a difference in you community? If so, becoming an Arizona Historical Society volunteer may be for you. Join the AHS Volunteer Team! We have opportunities at every location, and in every department. Complete the Volunteer Application form and submit to [email protected]. Questions? Call your local museum for more information. AHS volunteers benefit from their experiences in many ways. They experience Arizona history, develop new skills, and contribute to their community. Active volunteers receive a 10% discount at museum stores and free admission to the museums. Volunteers also enjoy the camaraderie on field trips, history presentations, and social events. Do you love history? Enjoy volunteering? 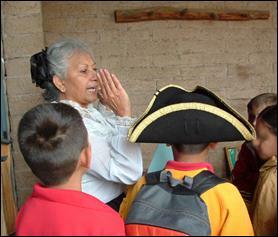 Join the Arizona Historical Society and our Los Amigos Docents and be a Tucson History Champion! Now accepting applications for our June 4 – July 8 History Explorers, a six-week volunteer adventure. Share your love of history and connect visitors and students to the wonders of Arizona History. Deadline is May 24. Please contact Eric Gonzales at the Arizona History Museum at 520-617-1142 or [email protected] for more information. Kid-friendly personalities are needed to lead tours and visit schools. Share your passion for Arizona history with generations to come. If you prefer behind-the-scenes activities and delving into history, volunteers are also needed to work with our collections, at our front desk, museum stores, grounds, facilities, and for general administrative assistance. The Arizona Historical Society offers internship opportunities to gain valuable hands-on experience, increase skills, and earn college credit. Tasks include oral history transcription, library and archives projects. You may work with artifacts and exhibits, education programs, or general assistance.